Robert Abell represents individuals and families that do the right things yet find themselves injured and harmed by the wrongdoing of others. If you think your insurance company is there to protect you when you have a serious car accident or injury -- think again! Your insurance company is in business to protect their company profits. You are driving down I-75 or I-64 through the heart of central Kentucky looking forward to a nice afternoon visiting with family and friends -- in an instant everything you know changes. A car or truck accident can throw you and your family into a crisis, surrounded by problems with medical bills, lost wages, insurance claims, pain and suffering, and even death. You have been injured, and you need help. Where do you find someone to guide you through this complex storm of legal problems? In Central Kentucky you can turn to an experienced, trustworthy, personal injury attorney, Robert L. Abell. With over 20 years experience handling complex cases, Robert Abell knows the tricks of the insurance companies and the legal ins and outs of medical claims. Working from his office in Lexington, Kentucky, Robert has earned a reputation for successfully handling complex cases representing individuals, consumers, employees and workers whose rights have been injured, harmed or damaged by wrongful and intentional misconduct or negligence. Lexington, Fayette County, Central Kentucky, Georgetown, Scott County, Frankfort, Franklin County, Winchester, Clark County, Richmond, Madison County, Nicholasville, Jessamine County, Versailles, Woodford County, Paris, Bourbon County, Williamstown, Grant County, Harrodsburg, Danville, Florence, Covington, Shelbyville, Berea, Louisville, Lawrenceburg, Anderson County, Stanton, Stanford, Lincoln County, Shelby County. This book is written in plain English, without complicated legal language. 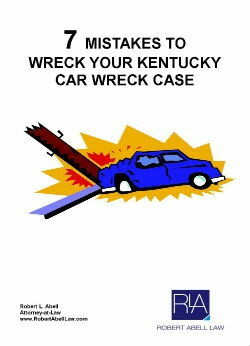 It is a resource for motor vehicle accident victims to show them the pitfalls in the injury claim process and to educate them on the mistakes in pursuing their own injury case.